We are a concierge bra fit specialty store catering from A-H cups. We are currently expanding our nursing bra selection (we carry several brands in our usual size run) as well as nursing accessories. Brooklyn Fox Lingerie has two locations, one in Cobble Hill and one in Williamsburg and we work with many pre and post partum women, making sure that they are comfortable and safe during their pregnancies and after. 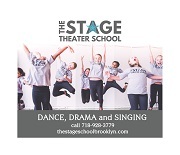 We would like to offer 15% off with proof of membership to Park Slope Parents.